b. The mil relationship, as shown in Figure 5-7, is X = W ^ R; where X is the angular width of the object in mils (f), W is the width of the object in meters, and R is the range or distance in thousands of meters. (1) To find Width when the known Range is 4,000 meters and the object is 15 f wide, multiply R times X f or 4 (range in thousands) times 15 (mils). 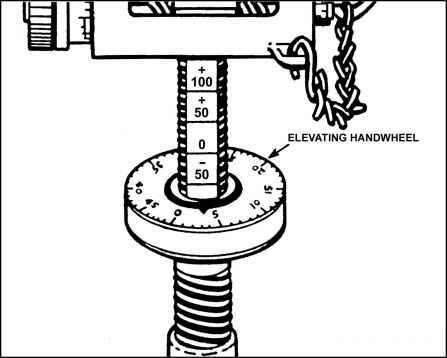 The answer is 60 (meters), or 4 x 15 = 60 meters. 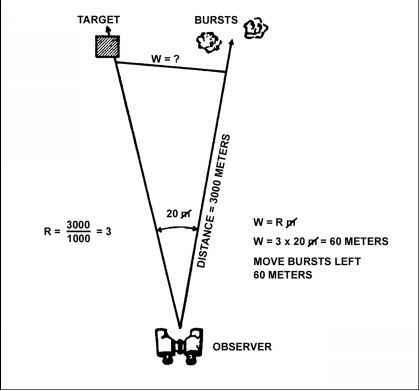 (2) To find Range when the known Width in meters (between two bursts or two obj ects) is 60 and the angular measurement for the same width, when measured with binoculars, is known to be 15 mils, divide (W: f ) 60 (meters) by 15 (mils). Figure 5-8. Computation of direction shift.